The quality of this necklace is excellent. The clasp is sturdy and easy to use. The necklace is 10k and has the rich look of 14k. The pendant is faceted and reflects light beautifully. 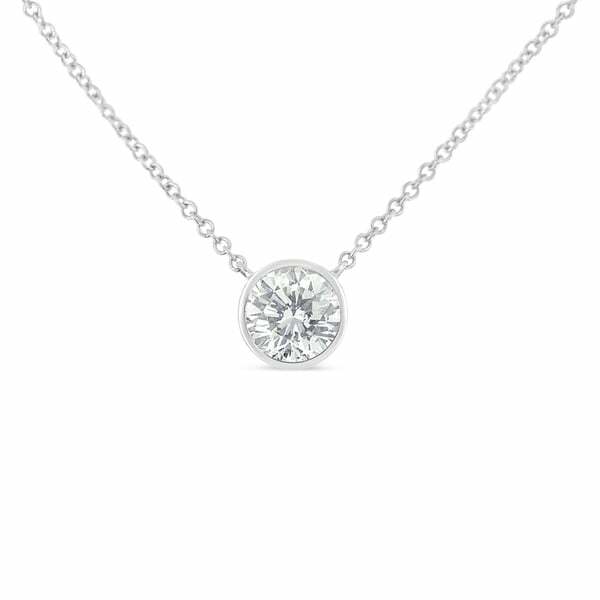 Some things shouldn't be reinvented, which is why we created the Solitaire Diamond Necklace. This is the perfect way to highlight every big occasion, transition, and personal achievement in your life. This Solitaire Diamond Necklace features a single, brilliant-cut .10 carat diamond in your choice of white, yellow, or rose gold bezel setting that hits at just the right place. Invest now; your future self will thank you later. Dimensions 0.2 In. X 0.2 In. X 0.08 In. This is exactly what I was looking for. It is a sparkly diamond, and a small bezel set as well. (some bezel settings have too much/too thick gold setting for my taste) This is just the right size for me. It is classy and small enough for daily wear. 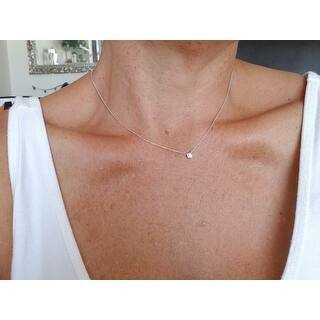 I also love that it is very light and comfortable and the delicate chain has 3 settings to find the perfect fit for where I want it to sit on my neck. In the picture I have it set at the smallest it can go, so maybe at 16". Perfect if you are looking for something small yet beautiful. Comes with 3 setting to adjust length. The gold around the diamond is slightly larger than I thought from the pictures, but the diamond center makes it shine. Highly recommend. Super pretty necklace!! Just as I expected from all the details in the listing.